Could you introduce Louie Louie and tell us a little about the history of the band? We are a four-piece rock band formed by Rita and later joined by Tom, her brother Pedro, and Eilish. Rita moved to Manchester from Lisbon looking to start a Rock 'n Roll band. She played acoustic in open-mics and jams at Big Hands every week until she met Tom, and her brother Pedro joined the line-up. We went on to play big headliners such as Academy 3, supported the likes of Lenny Kravitz and toured UK Portugal. Eilish from Ireland recently joined on drums. It feels like you've been around for quite some time on the scene in Manchester. Why has it taken so long to release your debut EP? When we started and didn’t know what we were doing, we spent a lot of time gigging and not enough time in the studio. We are constantly writing but could never really find the right sound before. So we just finally got it together basically! Could you walk us through the tracks please starting with Going Down? It appears to be essentially a catchy little pop number, but it has real melancholy behind it. It finds hope and solace in friendship whilst facing tragedy. It’s about being a bit lost, but accepting it and leaning on the people you love. You may recognise this one. We wanted another go at it as we evolved so much not just musically, but on a personal level. It becomes more and more relevant everytime we play it and its meaning deepens. It’s a feminist anthem. Our first real ballad! A celebration of what could have been and for whatever reason isn’t, an ode to the lifestyle we chose and the heartbreak that comes along with it. It’s a peak of emotions that happens at the peak of the summer, in the longest day of the year. Dark pop. It’s heavy and Black Sabbath influenced with an R’n’b twist and sultry vocals. The name pretty much says it all. A demo that shows a different side to what we can do. We wanted to share something a bit more personal and direct from the bedroom to the listener. The EP is called So It Begins, it's unusual that it's not named after one of the songs or self-titled. What made you choose that title? A lot of things have recently happened which felt like the end of something. We wanted a clean slate. Three different people from different backgrounds said those exact words on the day we had to choose a name, and we thought it conveyed our ambition and confidence. How do you write songs? Does one of you bring ideas to the band or is it a more collaborative effort? Your recent imagery on social media has made heavy use of lyrics. What made you take that approach? We’ve always felt like we have a strong visual element to our music and lyrics. Not having yet the budget to fulfil that vision entirely, we thought this would be a simple and personal way to express it. What are your plans following the EP? The plan is to work tirelessly, keep gigging, writing songs, and building up a larger following to eventually sign a good record deal and take over the world. Rita recently worked with Guy Garvey of Elbow and Pete Jobson of I Am Kloot on the soundtrack of the TV programme Cleaning Up. How did that come about? I met Pete and Guy a few years ago, at our favourite bars. They were part of a scene upon which I luckily stumbled when I first moved to Manchester, along with Indigo Jones and a few others. Their music and history had become a big reference to me and my songwriting. They had seen us play and heard me sing enough times that they wrote a song which they thought I’d be good for. It was an absolute joy and privilege to work with them and we had a blast! If you had to describe Louie Louie to some, one who'd never heard of you before, where would you start? 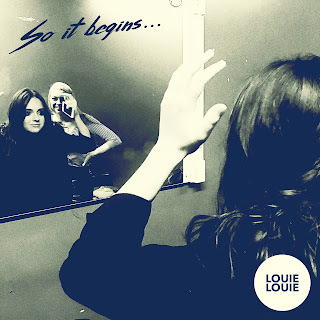 Louie Louie are on Facebook and Twitter. Our EP review can be found here.